A Balanced Scorecard includes a scorecard and a corresponding strategy map to display performance across four main organizational perspectives: financial perspective, customer perspective, internal perspective, and learning and growth perspective. For the example scorecard, we use a combination of fixed values and sample data from the Microsoft Contoso BI Demo Dataset for Retail Industry. To download and install this dataset, go to the Microsoft Download Center (http://go.microsoft.com/fwlink/p/?LinkId=219170). The KPIs that are described in this article are for informational purposes only to show how you can use PerformancePoint Services to create lots of KPIs that use different data sources and calculations. The KPIs that you use for your organization will likely vary from the examples that we describe in this article. For more information about Balanced Scorecards, see What is the Balanced Scorecard? (http://go.microsoft.com/fwlink/p/?LinkId=237539). You can organize the KPIs in a Balanced Scorecard into four perspectives: financial, customer, internal, and learning and growth. The following table describes the KPIs that we use in the example scorecard. Financial Perspective KPIs show performance for metrics such as revenue, growth, productivity, and other metrics related to increasing shareholder value. In the example scorecard, the Financial Perspective KPI shows overall performance for the Increase Shareholder Value, Productivity, and Growth KPIs. This KPI is an objective KPI that shows information based on the KPIs that are nested underneath it. The Increase Shareholder Value KPI shows overall performance for the Productivity and Growth KPIs. The Productivity KPI shows performance as measured by calculating the cost of sales as a percentage of total sales. This KPI uses data in the Sales cube of the ContosoRetailDW database. The Growth KPI shows performance as measured by growth in sales for the current year compared to growth in sales for the previous year. This KPI uses data in the Sales cube of the ContosoRetailDW database. This KPI can also use Time Intelligence functionality to show information for a particular period of time. Customer perspective KPIs show performance for metrics such as customer satisfaction, customer retention, brand strength, and market share. In the example scorecard, the customer perspective KPI shows overall performance for the Customer Satisfaction and Market Share KPIs. The Customer Satisfaction KPI shows performance as measured by overall customer satisfaction. This KPI uses fixed values that we specify. The Market Share KPI shows performance as measured by current market share. Internal KPIs show performance for metrics such as operations management, order fulfillment, and quality control. 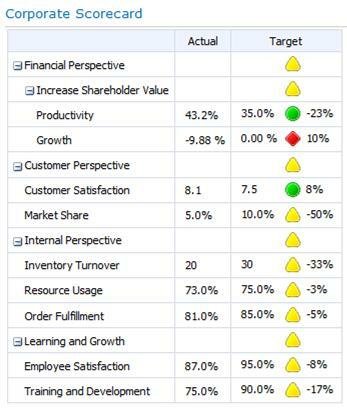 In the example scorecard, the Internal perspective KPI shows overall performance for the Inventory Turnover and Resource Usage KPIs. The Inventory Turnover KPI shows performance as measured by calculating the number of inventory cycles that occurred during the past year. The Resource Usage KPI shows performance as measured by the percentage of time sales representatives are engaged in selling activities. The Order Fulfillment KPI shows performance as measured by dividing current inventory by units sold and comparing that value to a target value. Learning and growth perspective KPIs show performance for metrics such as employee satisfaction, employee retention, and employee training and development. In the example scorecard, the Learning and growth perspective KPI shows overall performance for the Employee Satisfaction and Training and Development KPIs. The Employee Satisfaction KPI shows performance as measured by overall employee satisfaction. The Training and Development KPI shows performance as measured by the percentage of employees who have completed mandatory and recommended training programs. After defining the KPIs to use for the scorecard, the next step is to create the PerformancePoint data connections that are needed for some of those KPIs. This section describes how to create PerformancePoint data connections to data sources that are used for some of the example KPIs. Often, organizations will use different data sources, such as tables that are stored in Excel Services and SQL Server, cubes that are stored in SQL Server Analysis Services, and fixed values that dashboard authors enter manually. The procedures in this section assume that PerformancePoint Services is configured by using the Unattended Service Account. If your organization is using another security model, the steps that you follow to create a connection to a data source might vary. For more information, see Create data connections (PerformancePoint Services) and Configure PerformancePoint Services. First, create a connection to an Analysis Services data cube. The following procedure describes how to create a connection to the Sales cube in the ContosoRetailDW database. In the Workspace Browser, click Data Connections. On the Create tab, click Data Source. The Select a Data Source Template dialog box appears. In the Category pane, select All, in the Template pane, click Analysis Services, and then click OK.
A new data source opens for editing in the center pane. In the Connection Settings section, specify the name of the server where the Analysis Services data is stored. The Database list is populated. In the Database list, select ContosoRetailDW. The Cube list is populated. In the Cube list, select ContosoRetailDW. A Test Connection dialog box appears to confirm that you have successfully created the data connection. After you have tested the connection, close the Test Connection dialog box. In the center pane, click the Time tab, and then perform the steps in the following list to configure the data connection to work with Time Intelligence. Doing this configuration enables you to add a Time Intelligence filter to at least one KPI as described later in this article. For more information about Time Intelligence, see PerformancePoint Time Intelligence quick reference. In the Reference Data Mapping section, in the Time Dimension list, select Date.Calendar YQMD. This is a calendar-year time dimension that contains year, quarter, month, and day hierarchies. In the Reference Member section, in the Choose a date to begin the year for the selected time dimension box, type 2007-01-01. This value corresponds to the first day of the first year of data in the cube. In the Hierarchy level list, select Day. This enables you to use Time Intelligence formulas to display information at the day level. In the Reference Date section, type 1/1/2007. This helps align the dimension members with the correct hierarchies in the time dimension. In the Name box, type a name such as Contoso Retail Sales for the data connection. Optionally, in the Description box, type a description for the data source. Optionally, next to the Display Folder box, click the Browse button, and then specify or create a display folder for the data source. In the Workspace Browser, right-click the data source, and then click Save. The next step is to create a data connection to a table that is stored in SQL Server. This is a second data source that you will use for at least one KPI later in this article. In the Category pane, select All, in the Template pane, click SQL Server Table, and then click OK. In the Connection Settings section, specify the name of the server where the data is stored. In the Database list, select the ContosoRetailDW. The Table list is populated. In the Table list, select dbo.FactInventory. Test the connection, and then close the Test Connection dialog box. In the Name box, type a name such as Contoso Inventory for the data connection. Optionally, inn the Description box, type a description for the data source. After creating and configuring the data sources, the next step is to create KPIs. In this article, we describe how to create lots of KPIs. Some KPIs use different data sources, Calculated Metrics, and Time Intelligence, whereas other KPIs use fixed values. PerformancePoint Services enables you to easily create simple or sophisticated KPIs that use the same or different data sources. You can create the KPIs that we describe in this article, or you can create other KPIs to use in a scorecard. We begin by creating the Financial Perspective KPI. This KPI is an objective KPI that does not require a data source or specified target and actual values. On the Create tab, click KPI. In the Select a KPI Template dialog box, click Objective, and then click OK. The KPI opens for editing with the Editor tab open in the center pane. In the Name box, type Financial Perspective. Optionally, in the Description box, type a description for the KPI. Optionally, in the Person Responsible box, type the name of the person who is responsible for overall financial performance. Optionally, next to the Display Folder box, click the Browse button, and then specify or create a display folder for the KPI. In the Workspace Browser, right-click the Financial Perspective KPI, and then click Save. The next step is to create the Increase Shareholder Value KPI. Because this KPI is also an objective KPI, we can create a copy of the Financial Perspective KPI, and then change its name and other details. In the Workspace Browser, right-click the Financial Perspective KPI, and then click Copy. In the Workspace Browser, point to a folder such as PerformancePoint Content or point to a display folder in the PerformancePoint Content section, right-click to open a shortcut menu, and then click Paste. A copy of the Financial Perspective KPI opens for editing, with the Editor tab open in the center pane. In the Name box, type Increase Shareholder Value. Optionally, in the Person Responsible box, type the name of the person who is responsible for managing shareholder value. In the Workspace Browser, right-click the Increase Shareholder Value KPI, and then click Save. After you have created two objective KPIs for the Financial Perspective, the next step is to create the Productivity KPI. In the following example, we measure productivity by calculating expense (cost of sales) as a percentage of revenue (total sales). We create a KPI that uses Calculated Metrics by using the Sales cube in the ContosoRetailDW sample database. The Select a KPI Template dialog box appears. Click Blank KPI, and then click OK. The new KPI opens for editing with the Editor tab open in the center pane. In the Actual row, in the Data Mappings column, click the blue hypertext that says 1 (Fixed values). The Fixed Values Data Source Mapping dialog box appears. Click the Change Source button to open the Select a Data Source dialog box. Select the Calculated Metric tab, in the Templates section, click Blank Calculation, and then click OK. The Calculated Metrics Data Source Mapping dialog box appears. In the Name box, select the text that says Value1, and type SalesCost. In the Source column for the SalesCost row, click the blue hypertext that says 1 (Fixed Values). Select the Contoso Retail Sales data source, and then click OK. The Dimensional Data Source Mapping dialog box appears. In the Select a measure list, select Sales Total Cost, and then click OK to close the Dimensional Data Source Mapping dialog box and return to the Calculated Metrics Data Source Mapping dialog box. In the Calculated Metrics Data Source Mapping dialog box, in the Name box, select the text that says Value2, and then type TotalSales. In the Source column for the TotalSales row, click the blue hypertext that says 1 (Fixed Values). In the Select a measure list, select Sales Amount, and then click OK to close the Dimensional Data Source Mapping dialog box and return to the Calculated Metrics Data Source Mapping dialog box. In the Calculated Metrics Data Source Mapping dialog box, in the Formula box, type the formula SalesCost/TotalSales, and then click OK. In the Target row, in the Data Mappings column, click the blue hypertext that says 1 (Fixed values). In the Value box, type .35. This is a fixed value that represents 35%, a threshold for cost of sales. In this example, good performance means the cost of sales is less than 35% of the total sales. Click OK to close the Fixed Values Data Source Mapping dialog box. In the Actual row, in the Number column, click the blue hypertext that says (Default) to open the Format Numbers dialog box. In the Format list, select Percentage, and then click OK.
Repeat steps 5 and 6 for the Target row. In the Thresholds section, click Set Scoring Pattern and Indicator to open the Edit Banding Settings dialog box. In the Scoring pattern list, select Decreasing is Better, and then click Next. On the Select an Indicator page, click Next. On the Specify the worst value page, type 1, and then click Finish. This corresponds to 100%, which would mean that in a worst-case scenario, the cost of sales would equal the total sales. In the Name box, type Productivity. Optionally, in the Person Responsible box, type the name of the person who is responsible for productivity. In the Workspace Browser, right-click the Productivity KPI, and then click Save. After creating the Productivity KPI, the next step is to create and configure the Growth KPI. In this example, growth is measured by comparing growth in sales for the current year to growth in sales for the previous year. The Growth KPI uses Time Intelligence functionality. In the Fixed Values Data Source Mapping dialog box, click Change Source. In the Select a measure list, select Sales Amount Growth (Calendar Year). In the Select a dimension section, click New Time Intelligence Filter. In the Time Formula Editor dialog box, in the Time Formula pane, type Year-3, and then click OK.
Use Year-3 here because the Contoso Retail Sales database contains data for the calendar years 2007, 2008, and 2009 only. This Year-3 value causes the scorecard to display information as of 2009 when the actual calendar year is 2012. In the Time Formula Editor dialog box, in the Time Formula pane, type Year-4, and then click OK.
Use Year-4 here because the Contoso Retail Sales database contains data for the calendar years 2007, 2008, and 2009 only. The Year-4 value causes the scorecard to display information as of 2008 when the actual calendar year is 2012. Click OK to close the Dimensional Data Source Mapping dialog box. In the Name box, type Growth. Optionally, in the Person Responsible box, type the name of the person who is responsible for sales growth. In the Workspace Browser, right-click the Growth KPI, and then click Save. After creating the KPIs for the Financial Perspective, the next step is to create KPIs for the Customer Perspective. Begin by creating the Customer Perspective KPI. Because this is an objective KPI that resembles the Financial Perspective KPI, you can create a copy of the Financial Perspective KPI, and then change its name and other details. In the Workspace Browser, point to a folder such as PerformancePoint Content (or to a display folder in the PerformancePoint Content section), right-click to open a shortcut menu, and then click Paste. In the Name box, type Customer Perspective. Optionally, in the Person Responsible box, type the name of the person who is responsible for maintaining a healthy customer perspective. In the Workspace Browser, right-click the Customer Perspective KPI, and then click Save. The next step is to create the Customer Satisfaction KPI. Different organizations measure customer satisfaction in different ways, often using complex formulas that are outside the scope of the Balanced Scorecard. For this KPI, assume that customer satisfaction data comes from a third-party application, and use fixed values to configure the Customer Satisfaction KPI. In the Fixed Values Data Source Mapping dialog box, in the Value box, type 8.1, and then click OK. In the Fixed Values Data Source Mapping dialog box, in the Value box, type 7.5, and then click OK. In the Name box, type Customer Satisfaction. Optionally, in the Person Responsible box, type the name of the person who is responsible for guaranteeing customer satisfaction. In the Workspace Browser, right-click the Customer Satisfaction KPI, and then click Save. After creating a Customer Satisfaction KPI, the next step is to create the Market Share KPI. Similar to the Customer Satisfaction KPI, assume that the data for this KPI comes from a third-party application, and use fixed values to configure the Market Share KPI. In the Fixed Values Data Source Mapping dialog box, in the Value box, type .05, and then click OK. In the Actual row, in the Number Format column, click the blue hypertext that says (Default) to open the Format Numbers dialog box. In the Fixed Values Data Source Mapping dialog box, in the Value box, type .10, and then click OK. In the Target row, in the Number Format column, click the blue hypertext that says (Default) to open the Format Numbers dialog box. In the Name box, type Market Share. Optionally, in the Person Responsible box, type the name of the person who is responsible for increasing market share. In the Workspace Browser, right-click the Market Share KPI, and then click Save. After creating KPIs for the Customer perspective, the next step is to create KPIs for the Internal perspective. Begin by creating the Internal Perspective objective KPI. This KPI does not require a data source or specific actual and target values. In the Name box, type Internal Perspective. In the Workspace Browser, right-click the Internal Perspective KPI, and then click Save. After creating the Internal Perspective KPI, the next step is to create the Inventory Turnover KPI. Inventory turnover is typically calculated by dividing the total cost of goods sold by the average dollar value of inventory available. To create the Inventory Turnover KPI, this example uses Calculated Metrics by using two data sources and Time Intelligence for the Actual value, and a fixed value for the Target value. In the Select a KPI Template dialog box, click Blank KPI, and then click OK. In the Name box, select the text that says Value1, and then type CostOfSales. In the Source column for the CostOfSales row, click the blue hypertext that says 1 (Fixed Values). In the Select a measure list, select Sales Unit Cost. The Time Formula Editor dialog box appears. In the Time formula pane, type Year-3:Year-4. Use Year-3:Year-4 here because the Contoso Retail Sales database contains data for the calendar years 2007, 2008, and 2009 only. This formula causes the scorecard to display information for the range of time from 2008 to 2009 when the actual calendar year is 2012. Click OK to close the Time Formula Editor dialog box, and then click OK to close the Dimensional Data Source Mapping dialog box and return to the Calculated Metrics Data Source Mapping dialog box. In the Calculated Metrics Data Source Mapping dialog box, in the Name box, select the text that says Value2, and type Inventory. In the Source column for the Inventory row, click the blue hypertext that says 1 (Fixed Values). Select the Contoso Inventory data source that was created earlier, and then click OK. In the Select a measure list, select OnHandQuantity, and then click OK to close the Dimensional Data Source Mapping dialog box and return to the Calculated Metrics Data Source Mapping dialog box. In the Calculated Metrics Data Source Mapping dialog box, in the Formula box, type the formula CostOfSales/Inventory, and then click OK. In the Number column, click the blue hypertext that says (Default) to open the Format Numbers dialog box. In the Format list, select Number, and then click OK. In the Value box, type 30. This is a fixed value that will represent 30 inventory cycles, a threshold for inventory turnover. In this example, good performance means the company has had an inventory turnover of at least 30 inventory cycles over a one-year period. In the Name box, type Inventory Turnover. Optionally, in the Person Responsible box, type the name of the person who is responsible for managing inventory turnover. In the Workspace Browser, right-click the Inventory Turnover KPI, and then click Save. After creating the Inventory Turnover KPI, the next step is to create the Resource Usage KPI. Resource usage is typically calculated as a percentage of the time resources are used. In the example scorecard, resource usage is calculated as a percentage of sales representatives’ time that is spent generating sales. For this example, assume that the data for this KPI comes from a third-party application and use fixed values to configure this KPI. In the Fixed Values Data Source Mapping dialog box, in the Value box, type .73, and then click OK. In the Fixed Values Data Source Mapping dialog box, in the Value box, type .75, and then click OK. In the Target row, in the Number column, click the blue hypertext that says (Default) to open the Format Numbers dialog box. In the Name box, type Resource Usage. Optionally, in the Person Responsible box, type the name of the person who is responsible for maintaining sufficient resource usage. In the Workspace Browser, right-click the Resource Usage KPI, and then click Save. After creating the Resource Usage KPI, the next step is to create the Order Fulfillment KPI. Order fulfillment is typically calculated as a percentage of what merchandise is available at the time orders are made. In our example scorecard, order fulfillment is calculated by dividing units in inventory by units sold. For this example, assume that the data for this KPI comes from a third-party application and use fixed values to configure this KPI. In the Fixed Values Data Source Mapping dialog box, in the Value box, type .81, and then click OK. In the Fixed Values Data Source Mapping dialog box, in the Value box, type .85, and then click OK. In the Name box, type Order Fulfillment. Optionally, in the Person Responsible box, type the name of the person who is responsible for maintaining order fulfillment. In the Workspace Browser, right-click the Order Fulfillment KPI, and then click Save. After creating the KPIs we need for the Internal perspective, the next step is to create KPIs for the Learning and Growth perspective. Begin by creating the Learning and Growth Perspective KPI, an objective KPI that does not require a data source or specific target and actual values. In the Name box, type Learning and Growth Perspective. In the Workspace Browser, right-click the Learning and Growth Perspective KPI, and then click Save. After creating the Learning and Growth Perspective KPI, the next step is to create the Employee Satisfaction KPI. Similar to customer satisfaction rates, different companies measure employee satisfaction in different ways. For this example scorecard, assume that the data for this KPI comes from a third-party application and use fixed values to configure this KPI. In the Fixed Values Data Source Mapping dialog box, in the Value box, type .87, and then click OK. In the Fixed Values Data Source Mapping dialog box, in the Value box, type .95, and then click OK. In the Name box, type Employee Satisfaction. Optionally, in the Person Responsible box, type the name of the person who is responsible for maintaining employee satisfaction. In the Workspace Browser, right-click the Employee Satisfaction KPI, and then click Save. After creating the Employee Satisfaction KPI, the next step is to create the Training and Development KPI. Different companies measure training and development in different ways. For this example scorecard, measure performance for this KPI as measured by the percentage of employees who have completed mandatory and recommended training programs. Assume that the data for this KPI comes from a third-party application and use fixed values to configure this KPI. In the Fixed Values Data Source Mapping dialog box, in the Value box, type .90, and then click OK. In the Name box, type Training and Development. Optionally, in the Person Responsible box, type the name of the person who is responsible for training and development. Optionally, next to the Display Folder box, click the Browse button, and specify or create a display folder for the KPI. In the Workspace Browser, right-click the Training and Development KPI, and then click Save. After creating all the KPIs for the example scorecard, the next step is to create a blank scorecard and add the KPIs to it. Earlier in this article, you created lots of KPIs. Some of those KPIs are objective KPIs, which means those KPIs display performance for KPIs that are nested underneath the objective KPIs. To create the scorecard, begin with a blank scorecard, add all the KPIs to the scorecard, and then configure a hierarchy for the KPIs. In the ribbon, on the Create tab, in the Dashboard Items group, click Scorecard. The Select a Scorecard template opens. In the Category pane, select Standard, in the Template pane, select Blank Scorecard, and then click OK. A blank scorecard opens for editing with the Editor tab open. In the Details pane, expand KPIs, and then expand PerformancePoint Content. Locate the KPIs that you want to use for the scorecard. Click the Increase Shareholder Value KPI to select it, and then, in the ribbon, on the Edit tab, in the Header group, click the Increase Indent toolbar command. The Increase Shareholder Value KPI is now nested underneath the Financial Perspective KPI. Click the Productivity KPI, and then, on the Edit tab, click the Increase Indent toolbar command two times to nest Productivity underneath Increase Shareholder Value. Click the Customer Satisfaction KPI, and then, on the Edit tab, click the Increase Indent toolbar command to nest Customer Satisfaction underneath Customer Perspective. Click the Market Share KPI, and then, on the Edit tab, click the Increase Indent toolbar command to nest Market Share underneath Customer Perspective. Click the Inventory Turnover KPI, and then, on the Edit tab, click the Increase Indent toolbar command to nest Inventory Turnover underneath Internal Perspective. Click the Resource Usage KPI, and then, on the Edit tab, click the Increase Indent toolbar command to nest Resource Usage underneath Internal Perspective. Click the Order Fulfillment KPI, and then, on the Edit tab, click the Increase Indent toolbar command to nest Order Fulfillment underneath Internal Perspective. Click the Employee Satisfaction KPI, and then, on the Edit tab, click the Increase Indent toolbar command to nest Employee Satisfaction underneath Learning and Growth Perspective. Click the Training and Development KPI, and then, on the Edit tab, click the Increase Indent toolbar command to nest Training and Development underneath Learning and Growth Perspective. On the Edit tab, in the View group, click Update. The scorecard updates to show performance for all the KPIs. In the Name box, type a name, such as Corporate Scorecard. Optionally, in the Description box, type a description for the scorecard. Optionally, in the Person Responsible box, type the name of the person who is responsible for organizational performance. Optionally, next to the Display Folder box, click the Browse button, and then specify or create a display folder for the scorecard. In the Workspace Browser, right-click the Corporate Scorecard, and then click Save. After you have created a scorecard to use as part of a Balanced Scorecard, the next step is to create a strategy map by using Dashboard Designer. For more information, see Create and configure a strategy map as part of a Balanced Scorecard that you create by using Dashboard Designer.